The assessment of the anticoagulant effect of direct oral anticoagulants (DOACs) can be important for rapid medical decision-making, especially in patients needing immediate management. An assay that screens for the absence or presence of a DOAC would help accelerate treatment in these situations. Chromogenic and coagulation methods have several limitations, including limited accuracy, long turnaround time, and their need of specialized laboratories. Oral factor Xa and thrombin inhibitors are also eliminated by the kidneys and can be detected in patient urine samples using a single, rapid, sensitive, and patient-specific qualitative assay. In these tests, the presence or absence of a DOAC in urine can be identified by visually observing specific colors after a few minutes. Several studies have demonstrated the robustness and repeatability of these assays. The specific colors of the test strip also detect creatinine in the urine, which shows whether DOAC excretion is reduced, thus suggesting renal impairment. Persons with amblyopia may use a specific reader. Current indications for using the DOAC Dipstick test include emergency medical situations with severe bleeding and thrombotic events or before urgent major surgical interventions to accelerate medical decision-making. Direct oral anticoagulants (DOACs) such as dabigatran, rivaroxaban, apixaban, and edoxaban are approved in many countries for the prevention of ischemic stroke in patients with atrial fibrillation, prophylaxis of postoperative venous thromboembolism following elective knee or hip replacement surgery, treatment of acute venous thromboembolism, prolonged prophylaxis to prevent recurrent thromboembolic events, and even management of acute coronary syndrome. For all indications, DOACs can be administered in fixed doses, without the need for routine laboratory-guided dose adjustment. Consequently, routine plasma samples were not collected to assess anticoagulation status in the pivotal studies but were only drawn in specific patient subgroups. However, it is important to measure anticoagulation in some patient populations, such as prior to surgery, when renal function deteriorates, during bleeding or thrombotic episodes, and to assess adherence to therapy. DOACs prolong coagulation or clotting times to different degrees in several clotting assays. DOACs inhibit factor Xa or thrombin, which can be detected with chromogenic substrate assays. The oral direct factor Xa inhibitors rivaroxaban, apixaban, and edoxaban also prolong the prothrombin time (PT) and activated partial thromboplastin time (aPTT) to different degrees depending on the DOAC and the sensitivity of reagents. PT and aPTT are also affected by pathological conditions in various diseases, which can reduce their specificity to anticoagulants such as DOACs. The main advantage of PT and aPTT is that they can be routinely performed in all laboratories around the clock. HepTest and HepTest STAT are more useful for the measurement of direct oral factor Xa than PT/aPTT and Hemoclot. Thrombin clotting time and ecarin clotting time (ECT) tests were reported to be more specific for the determination of oral direct thrombin inhibitors than PT/aPTT assays. These more specific tests also have their limitations. For example, Hemoclot test results were highly variable in patients undergoing mechanical artificial heart valve replacement and receiving dabigatran 150 to 300 mg twice daily, despite exact timing of blood sampling for coagulation analyses, indicating its limited analytical sensitivity and specificity in this clinical setting. Furthermore, these are specialized tests and can only be performed in specialist laboratories at defined times (usually normal working hours). Chromogenic assays are based on the specific inhibition of factor Xa or thrombin in the presence of enzyme-specific chromogenic substrates. These assays determine the effect of oral direct factor Xa inhibitors rivaroxaban, apixaban, edoxaban and that of the oral direct thrombin inhibitor dabigatran. DOAC measurement needs to be carefully standardized for each individual chromogenic substrate method using specific calibrators for every DOAC, and these calibrations need to be performed with every coagulation platform. This makes specific chromogenic assays time-consuming and restricts their availability and when they can be performed. The availability of the specific coagulation assays for DOACs ranges from less than 2 to 39% in coagulation laboratories and much less in smaller laboratories and community hospitals. Qualitative DOAC detection from coagulation parameters gave results below, within, and above the normal range, but the assay sensitivities and specificities were still low. Liquid chromatography coupled with tandem mass spectrometry (LC-MS/MS) is the gold standard assay for DOAC quantitative assessment. This method is used to compare the sensitivity and specificity of chromogenic substrate assays and of coagulation assays for DOACs. These investigations showed a high correlation of DOAC quantification between LC-MS/MS, and chromogenic substrate assays and Hemoclot (Pearson correlation r > 0.95). Other analyses of plasma samples from patients receiving therapy with these anticoagulants have revealed only a sensitivity and specificity of 50 to 80%. However, these methods can only be performed in a small number of specialized laboratories and therefore their availability remains very limited. To detect DOACs in blood samples in emergency situations, point-of-care (POC) coagulometer instruments may offer advantages over conventional clotting assays. However, the results from plasma samples of patients receiving dabigatran and rivaroxaban are variable, which limits their usefulness in acute clinical conditions. A whole-blood clotting time assay based on surface acoustic waves has been evaluated in stroke patients treated with phenprocoumon, dabigatran, rivaroxaban, and apixaban. This assay can determine the anticoagulant level in patients receiving dabigatran, rivaroxaban, and phenprocoumon, but not apixaban. The Hemochron Signature system (Accriva Diagnostics) uses testing cards that measure the activated clotting time (ACT) and PT and determines blood coagulation by photo-detection. The ACT and PT are prolonged in the presence of vitamin K antagonists (VKAs), DOACs, and heparins if reagents do not contain heparin neutralizers. They can be used to qualitatively rule out the presence of clinically relevant concentrations of rivaroxaban and dabigatran, with sensitivities of 96 and 98% but with low specificities of 67 and 66%, respectively. The Cascade Abrazo POC test system (Helena Laboratories) includes specific testing cards and is currently under development. This blood test will detect inhibitors to thrombin and factor Xa and is based on photo-detection of coagulation. Perosphere Technologies Inc. offers a broad array of anticoagulant testing, including DOACs, unfractionated heparin, low molecular weight heparin, fondaparinux, and warfarin using a broad-spectrum POC coagulometer. The certified in vitro diagnostic (IVD) medical device DOAC Dipstick (DOASENSE GmbH) was developed based on the rationale that DOACs are excreted into and may be detectable in the urine. When detecting DOACs in urine, it is important to consider that plasma coagulation proteins will not be present, unlike in blood or plasma samples. This may be an advantage because blood cells, plasma proteins, and naturally occurring coagulation inhibitors will not be able to interact with DOACs and may not interfere with the results of the DOAC Dipstick. This test gives qualitative results regarding the absence or presence of DOACs in a patient's urine sample for both direct oral factor Xa inhibitor and oral thrombin inhibitors. This single-use assay has a turnaround time of 10 minutes, and results can be determined by visual identification of specific colors with the naked eye. Between 30 and 80% of DOACs are excreted into the urine by the kidney, depending on the specific DOAC (e.g., ranging from 80% for dabigatran to ∼33% for rivaroxaban and 25% for apixaban). The DOAC Dipstick contains a matrix where specific enzymes and substrates directed against direct oral factor Xa and thrombin inhibitors are immobilized to detect DOACs directed to factor Xa and thrombin. The excretion of both DOACs and creatinine from blood is reduced as renal function decreases. As a result, DOAC and creatinine blood concentrations increase in response to renal dysfunction. Therefore, determining creatinine levels in the urine can aide correct interpretation of DOAC presence in urine and detect any impairment of renal function. Based on this, a pad for determining creatinine was added to the DOAC Dipstick. There is one pad each for the detection of direct oral factor Xa and thrombin inhibitors, creatinine in urine, and normal or abnormal urine color. The results can be identified by the naked eye. The position and order of the DOAC Dipstick pads are shown in [Fig. 1]. Fig. 1 Schematic scheme of the in vitro diagnostic direct oral anticoagulant (DOAC) Dipstick for determining anti-IIa and anti-Xa DOACs and of creatinine in urine samples of patients. The reagents are immobilized on the surface of the DOAC Dipstick pads. When the reagents react with urine, specific colors develop according to the action of factor Xa or thrombin on the release of a chromophore bound to a substrate. Chromophore release is negatively related to the amount of DOAC in urine, and different chromophore colors indicate the absence or presence of factor Xa and thrombin inhibitors on the same test strip. Yellow indicates the absence of factor Xa inhibitors, and white indicates the presence of factor Xa inhibitors. Ochre indicates the absence of thrombin inhibitors, and rose indicates the presence of thrombin inhibitors. The pad colors can be visually identified as early as 10 minutes after incubation of the test strip with a urine sample. Pad colors are printed on the test tube for comparison ([Fig. 2]). Fig. 2 Color label showing the direct oral anticoagulant (DOAC) Dipstick test results in the absence (negative (neg.) (left field) and presence (positive (pos.) (middle and right field) of thrombin inhibitor and factor Xa inhibitor, normal (norm.) urine color/Urinfarbe (English/German), and normal (norm.) (left and middle field) and low creatinine/Kreatinin in a urine sample. The test for detecting creatinine in urine is based on a reaction of creatinine with 3.5-dinitrobenzoic acid in an alkaline medium that produces a violet color. The intensity of the violet color depends on the creatinine concentration ([Fig. 2]). The control pad for determining normal urine color does not contain reagents. The amount of urine absorbed by the pads is too low to produce any visible color; therefore, the yellow color of normal urine does not influence the colors observed on the other pads. The reaction time of this pad is only a few seconds and can be seen by visual detection immediately after incubation of test strips. Test strips are immersed in the urine sample for 2 to 3 seconds, ensuring that all test pads are completely covered by the urine. After removal from the urine, excess liquid is removed from the test pad using a tissue. The tests strips are then placed on a flat surface and left for 10 minutes. Then, the test pad colors can be compared with the corresponding color scales on the tube label by the naked eye. The pad colors shown on the tube label demonstrate the possible test results and should be examined carefully ([Fig. 2]). These colors correspond to defined values according to the CMYK (cyan, magenta, yellow, and key [black]) scale (data not shown). [Figs. 3A] and [3B] show example results for two test strips 10 minutes after reaction with urine, respectively, containing rivaroxaban or dabigatran. These colors can be compared with the colors in [Fig. 2]. Fig. 3A–D Photos of colors of pads of direct oral anticoagulant (DOAC) Dipstick with test results and their interpretation in the absence of an anti-IIa, presence of an anti-Xa inhibitor, normal urine color, and normal creatinine (A), presence of an anti-IIa, absence of an anti-Xa inhibitor, normal urine color, and normal urine color example of color for low creatinine (B), urine sample with low creatinine resulting in nonevaluable colors to detect a direct factor Xa (pad 3) and direct oral thrombin inhibitor (pad 4) that may be false-negative (C), and urine sample with an abnormal urine color of pad 2 resulting in colors of factor Xa and thrombin inhibitor and creatinine pads which are therefore not evaluable (D; pads 1, 3, and 4). If the color of pad 1 corresponds to the “normal” color (norm) or is between the “norm” or “low” colors on the tube label, then creatinine in the urine is normal, indicating normal renal function ([Figs. 2], [3A], and [3B]). The elimination of DOACs into urine is also normal, and pads 3 and 4 will show whether direct factor Xa and thrombin inhibitors are present in the urine or not. If the color of pad 1 corresponds to the “low” color or is lighter than the respective color on the tube label, then creatinine in the urine is low, indicating renal insufficiency. DOAC elimination from blood may be decreased, which may give a false-negative DOAC result on pads 3 and 4. If the pad color is white, like the respective color marked “norm” on the tube label, then the colors of pads 1, 3, and 4 can be visually evaluated and are not modified by urine color ([Figs. 2], [3A], [3B], and [3C]). If the color of the pad is darker than the color “norm” on the tube label, the colors of pads 1, 3, and 4 may be falsified. The color develops within a few seconds after dipping the test strip into urine and can be immediately identified by the naked eye ([Fig. 3D]). The test pad detects all currently licensed direct oral factor Xa inhibitors, that is, apixaban, edoxaban, and rivaroxaban. The different inhibitors cannot be distinguished. If the color of pad 3 is yellow, like the color marked “neg.” (negative) on the tube label, then direct oral factor Xa inhibitors are not present in the urine sample ([Figs. 2] and [3B]). If the color of pad 3 is less yellow than the color marked “neg.” or is white, like the color marked “pos.” (positive) on the tube label, then one direct oral factor Xa inhibitor is present in the urine ([Figs. 2] and [3A]). 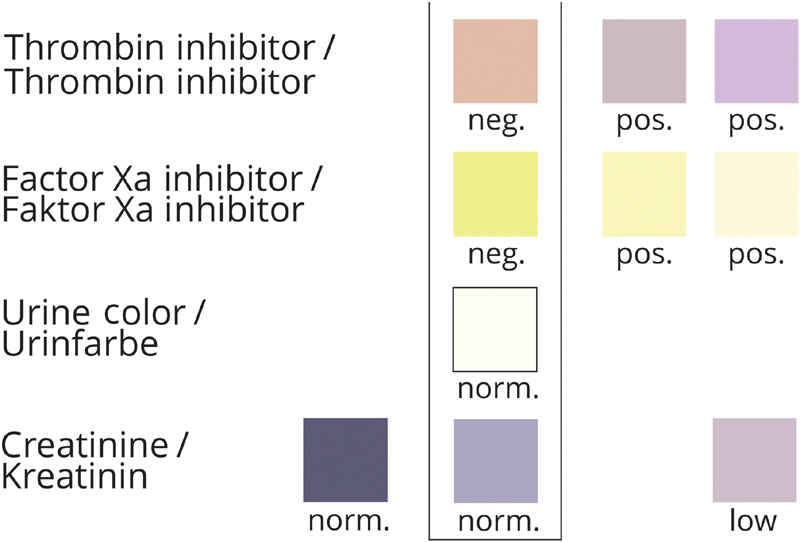 If the color of test pad 4 is ochre, like the color marked “neg.” on the tube label, then a direct oral thrombin inhibitor is not present in the urine sample ([Figs. 2] and [3A]). If the color of pad 4 is between the ochre color marked “neg.” and the rose color marked “pos.,” or rose, like the color marked “pos.” on the tube label, then a direct oral thrombin inhibitor is present in the urine ([Figs. 2] and [3B]). If both test pads 3 and 4 show a positive result after testing a patient urine sample, then the test is invalid because it is unlikely that a patient has been treated with both types of DOACs. The results must always be interpreted and evaluated in connection with other clinical information by a physician before diagnosis. Treatment decisions should not be based solely on the outcome of a DOAC Dipstick analysis. Additional laboratory analysis (e.g., determination of blood coagulation parameters) may be required. Persons with red-green color vision deficiency or color blindness cannot perform the DOAC Dipstick test. If such color deficiency of a professional user is unknown, he/she must be able to correctly identify the colors of pads 1 and 4 (creatinine and thrombin inhibitor) to be able to perform the test. Normal concentrations of creatinine in urine range between 0.25 and 3 g/L (2.2–26.5 mmol/L). Normal dabigatran, apixaban, edoxaban, and rivaroxaban values in urine are below 5 ng/mL (LC-MS/MS method). The analytical sensitivity of the visual evaluation is around 95 ng/mL for factor Xa and thrombin inhibitors (unpublished). Patients receiving DOAC treatment typically have values above 200 ng/mL in urine. Below and above these concentrations, the sensitivities and specificities for factor Xa and thrombin inhibitors are >95% for the detection of the absence or presence of anticoagulants in urine (data on file). It has to be considered that the concentration of DOACs in urine is much higher than the corresponding levels in plasma due to their high excretion rate into a relatively small volume of urine as compared with blood volume. No information is reported in the literature on drug–drug and drug–other compounds interactions with DOACs, except for the colored compounds in the urine described previously. The number of interactions tends to be low to very low because the enzymes are highly specific for their respective substrates. No interaction occurs between the components that detect factor Xa inhibitors on test pad 3 and thrombin inhibitors on test pad 4, and vice versa, according to data from patient urine samples (p < 0.001). The lack of interaction between pad components can be seen in [Figs. 3A] and [3B]. Unfractionated heparin, low molecular weight heparin enoxaparin (tested up to 1 IU/mL), and fondaparinux (tested up to 1 µg/mL) did not react with factor Xa inhibitor and thrombin inhibitor components on the test pads in the absence or presence of rivaroxaban or dabigatran. Normal human urine does not contain antithrombin; therefore, heparins are unable to interact with factor Xa and thrombin. 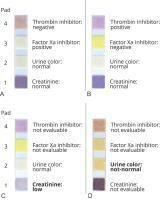 Colored compounds in urine such as protein, urobilinogen, and red blood cells (i.e., hematuria) may influence the visual interpretation of test pad colors for creatinine, and inhibitors to factor Xa and thrombin. The impact of urine's color can be assessed by the control test pad, which does not contain reagents. Fifteen urine samples with elevated concentrations/amounts of urobilinogen and red blood cells were analyzed. Four of the 15 samples showed a dark color and had high concentrations of protein or urobilinogen or showed macrohematuria. These four urine samples showed an abnormal dark color on the urine color pad. Therefore, the colors of the other pads could not be correctly interpreted ([Fig. 2]). 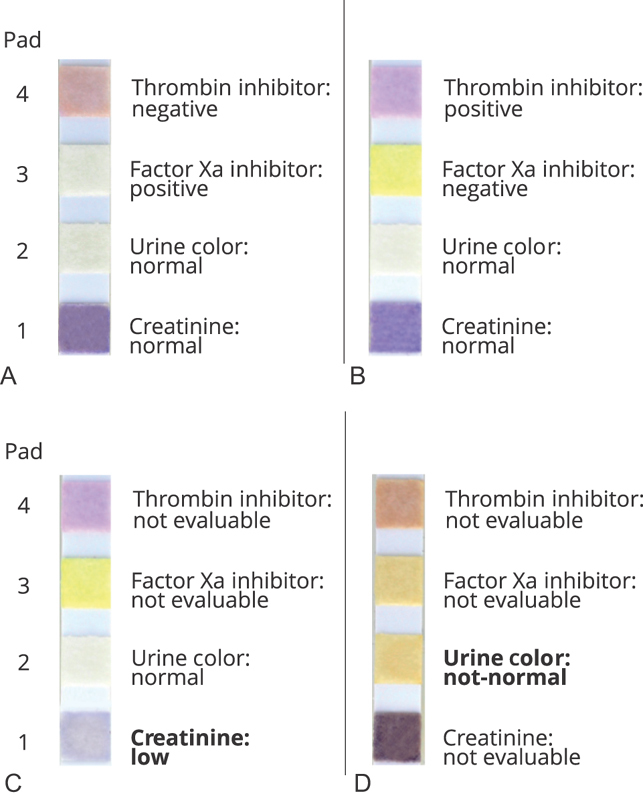 An abnormal urine control pad color indicates that the colors of the creatinine, and factor Xa and thrombin inhibitor test pads cannot be properly interpreted after testing a urine sample. This is true for low or normal concentrations of creatinine, and no, low, or high concentrations of DOACs ([Fig. 3D]). In urine samples with high false-negative buffering capacity and high concentrations of ketone bodies (>50 mmol/L), false-positive results may be obtained. Liquid chromatography coupled with tandem mass spectrometry is the method of choice for measuring DOAC concentrations in plasma or serum. To validate the results obtained with the DOAC Dipstick, an LC-MS/MS method was developed for urine. The chromatography system consisted of an ACQUITY H-Class UPLC System connected to an Autosampler, quaternary HPLC-Pump, Xevo TQ-S mass spectrometry detector, and a CSH C18 Column (100 × 2.1 cm; pore size: 1.7 µm) (all from Waters GmbH). A total of 100 µL of urine samples were mixed with a solution of 70% methanol and 30% acetonitrile for 1 minute for purification before analysis and then centrifuged at 10,000 g. An aliquot of the clear supernatant was then diluted 1:100 with methanol and transferred to a 96-well plate. Then, 5 μL of these samples were injected into the HPLC system for analysis. As an internal standard, a solution of 100 µg/L Risperidone D4 was used. Samples were eluted with buffer A (2.5-mM ammonium formate, pH 3.5) and buffer B (methanol) over 6 minutes at a flow rate of 450 µL per minute. The lower limits of detection and the lower limits of quantification were 0.4 and 1.2 µg/L for dabigatran, 1.2 and 3.6 µg/L for apixaban, 1 and 3 µg/L for edoxaban, and 0.1 and 0.4 µg/L for rivaroxaban, respectively. The linear concentration range of the method was 0 µg/L to 5,000 µg/L for all DOACs. Samples with concentrations higher than 1,000 µg/L were prediluted with normal urine. The intra- and interday coefficients of variations were below 11.3 and below 9%, respectively, for all DOACs up to 1,000 µg/L. 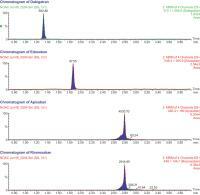 The typical chromatograms of dabigatran, edoxaban, apixaban, and rivaroxaban are shown in [Fig. 4]. Fig. 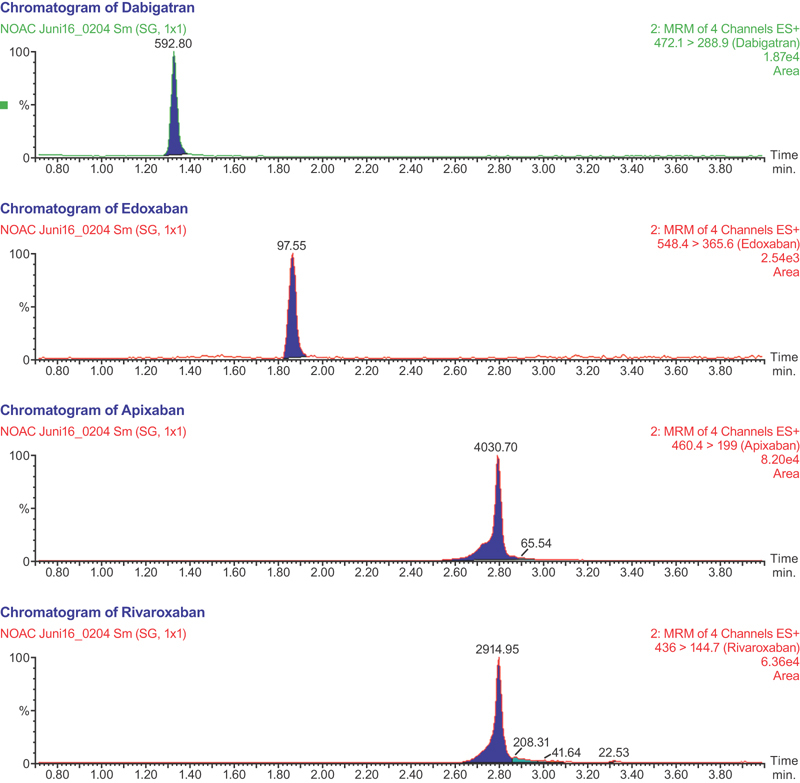 4 Chromatograms of the direct oral anticoagulants in urine samples using the liquid chromatography coupled with tandem mass spectrometry method. Urine samples were analyzed using the DOAC Dipstick. The samples were from patients on steady-state therapy with dabigatran 150 mg twice daily (n = 30), rivaroxaban 20 mg once daily (n = 30), and apixaban 5 mg twice daily (n = 29), and from control individuals (n = 30) not treated with a DOAC or another anticoagulant. Urine samples were taken between 2 to 6 hours after anticoagulant intake. Urine was analyzed for DOACs qualitatively using two lots of DOAC Dipstick and quantitatively by LC-MS/MS. The strip colors were analyzed by two independent observers according to the methods described previously. The DOAC pad colors were all interpreted correctly by the observers ([Table 1]). The reliability (agreement between observers, kappa index) was 100% for all DOACs, and 95% confidence intervals from 73 to 100% (apixaban) and 74 to 100% (rivaroxaban and dabigatran) were reported ([Table 2]). The validity of the visual analysis results was compared with the LC-MS/MS results and was 100% for all DOACs, with 95% confidence intervals ranging from 73 to 100% (apixaban) and from 74 to 100% (rivaroxaban and dabigatran, [Table 2]). There were no differences in results using a second lot of DOAC Dipstick strips ([Tables 1] and ). DOAC concentrations (LC-MS/MS) were below 10 ng/mL in control samples and ranged from 1,057 to 15,996 ng/mL (with dabigatran treatment), 169 to 9,579 ng/mL (with rivaroxaban treatment), and 202 and 6,667 ng/mL (with apixaban treatment) ([Table 3]). DOAC concentrations are higher in urine than in blood because the volume of urine is lower compared with the volume of DOAC distribution in blood. Abbreviations: DOAC, direct oral anticoagulant; neg., negative; pos., positive. Abbreviations: CV, coefficient of variation; LC-MS/MS, liquid chromatography coupled with tandem mass spectrometry; SD, standard deviation. Patients may analyze the DOAC Dipstick test results by themselves in the future. To assess this, urine samples were obtained from patients with atrial fibrillation using dabigatran 110 mg twice daily or 150 mg twice daily or with venous thromboembolism using rivaroxaban 20 mg once daily. Control urine samples were obtained from patients not receiving therapy with anticoagulants. The patients visually identified the test colors, and their interpretations were analyzed. Persons (n = 16) receiving DOAC therapy performed the test after careful expert instruction on how to identify and interpret the colors. The results are given in [Table 4]. Abbreviations: CI, confidence interval; NPV, negative predictive value; POC, point-of-care; PPV, positive predictive value. The calculated sensitivities, specificities, accuracies, and positive and negative predictive indices for the detection of dabigatran and rivaroxaban were all > 95%. One of the patients had red-green blindness and was unable to identify the test strip colors for the determination of dabigatran. Therefore, persons with known red-green amblyopia cannot perform the DOAC Dipstick test. A person who wants to perform the test can check whether he/she has amblyopia by identifying the thrombin inhibitor and creatinine colors on the DOAC Dipstick label that is attached to the test tube. An interlaboratory study was performed to determine the variance of DOAC Dipstick results for rivaroxaban, apixaban, and dabigatran and to analyze the sensitivity and specificity of the Dipstick test for factor Xa- and thrombin inhibitors. Six urine samples from patients treated with dabigatran 150 mg twice daily, rivaroxaban 20 mg once daily, and apixaban 5 mg twice daily, or controls without any anticoagulant therapy (n = 4) were sent to seven laboratories for DOAC detection using the test strips. Samples were sent to the laboratories on dry ice. Participants received detailed instructions on how to perform the test and a prepared Excel sheet to document the results. All samples were visually judged as being either positive (DOACs present) or negative (DOACs absent). The colors that developed 10 minutes after test strips were immersed in urine samples and photographed at each participating center. The mean kappa index values that represent agreement between centers, sensitivity, specificity, and negative and positive predictive value were all between 0.93 to 1 for apixaban, rivaroxaban, and dabigatran ([Table 5]). Median values and 95% confidence intervals are reported in [Table 2]. Abbreviations: CI, confidence interval; DOAC, direct oral anticoagulants; NPV, negative predictive value; POC, point-of-care; PPV, positive predictive value. This study shows the robustness of the DOAC Dipstick test between observers at different laboratories, as well as the high sensitivity and specificity of qualitative DOAC determination in the same urine samples of patients receiving treatment. Furthermore, the results demonstrate easy performance, high agreement between observers, and feasibility of the assay confirmed by a large group of experts around the world using detailed instructions for use. From the clinical point of view and for medical decision-making in an emergency situation, a false-negative DOAC result may harm a patient more than a false-positive. In addition, clinical decisions should not be based solely upon the IVD DOAC Dipstick results. The clinical context of the patient̀s disease must be considered. A position for the IVD DOAC Dipstick in a clinical setting is suggested in the flow diagrams using the examples of a patient presenting with acute bleeding ([Fig. 5]) and a patient who needs urgent surgical intervention ([Fig. 6]). The flow charts indicate (1) faster decision-making by detecting DOACs using the IVD DOAC Dipstick and (2) the need for only one laboratory test to identify the type of DOAC. The latter reduces laboratory testing as well as costs. The determination of DOACs is required in patients in emergency medical situations. One group of patients suffers from severe bleeding or thrombotic events with known or unknown intake of an anticoagulant. Whether an anticoagulant is the cause of bleeding needs to be verified. 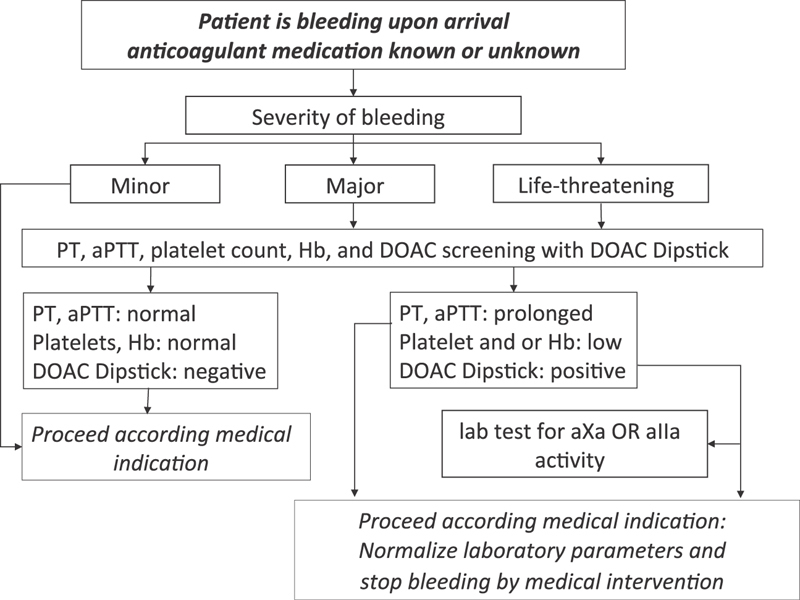 A flow chart for using the IVD DOAC Dipstick to accelerate clinical decision-making in patients with a major bleeding event is shown in [Fig. 5]. The other group of patients has to undergo an urgent surgical intervention. Surgeons, neurologists, or other specialists verify whether the patient has taken anticoagulants before starting the surgical or medical intervention ([Fig. 6]). This may also be important for dosing drugs acting on blood coagulation and fibrinolysis. In a patient with an unknown medication/anticoagulant history, the result obtained with the IVD DOAC Dipstick reduces the number of coagulation assays needed to identify the two types of DOACs from two to one, that is, factor Xa- or thrombin inhibitors ([Figs. 5] and ). Practitioners may wish to detect DOACs in specific medical situations for several reasons. However, nonemergent surgical interventions do not require testing for DOACs before surgery because surgery can be deferred. Patients may wish to use the test to check adherence to therapy. For patients, this has to follow the principles available for self-monitoring or self-management, such as the POC device used by patients treated with VKAs. The first results of the usability of the DOAC Dipstick to detect DOACs in urine by patients have been reported. Fig. 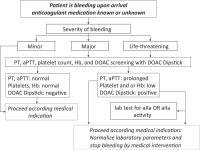 5 Flow diagram for using the in vitro diagnostic direct oral anticoagulant (DOAC) Dipstick for clinical decision-making in patients with an acute bleeding event and with known or unknown DOAC medication. Fig. 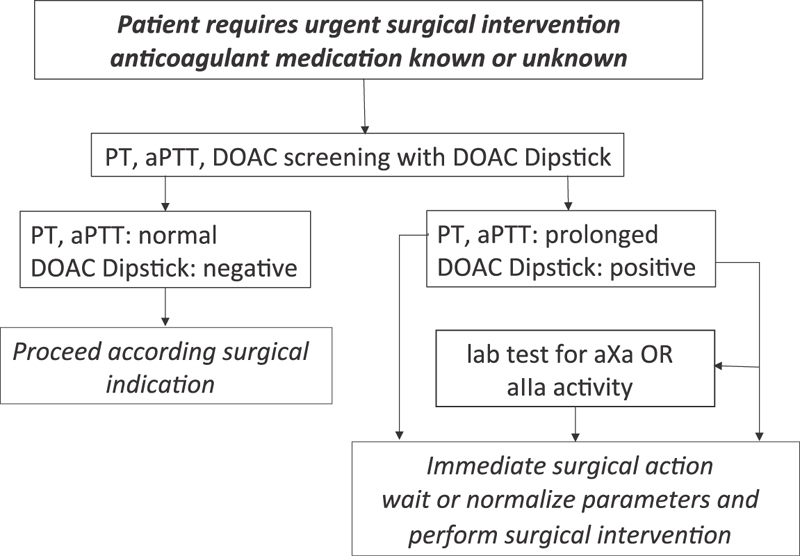 6 Flow diagram for using the in vitro diagnostic direct oral anticoagulant (DOAC) Dipstick for clinical decision-making in patients about to receive an acute major surgical intervention with known or unknown DOAC medication. DOACs are small molecules with a molecular weight of approximately 500 Dalton. Renal function plays a major role in DOAC metabolism, ranging from 80% for dabigatran to approximately 33% for rivaroxaban and 25% for apixaban. A method for detecting DOACs in urine was developed using activity-based assays. A prototype of the test was described for DOACs assessment in urine samples of patients using wet chemistry. This technique was later developed to the IVD DOAC Dipstick using dry chemistry techniques. Creatinine levels and urine color can also be determined with specific pads on the IVD DOAC Dipstick. These pads detect impaired renal function and abnormal urine colors that may impair the interpretation of results. National and international consensus statements and guidelines for the laboratory determination of DOACs have described the limited validity or clinical usefulness of coagulation assays such as PT, aPTT, thrombin time (TT), diluted TT, Hemoclot, ECT, chromogenic antifactor Xa, and antithrombin assays. LC-MS/MS of plasma or serum samples is currently the gold standard method. Limitations of coagulation methods result from the wide range of values obtained from patients receiving DOAC treatment and from untreated control persons. Algorithms for clinical decision-making in patients treated with rivaroxaban, apixaban, and edoxaban are based on PT and aPTT results, and algorithms for clinical decision-making in patients treated with dabigatran are based on aPTT, TT, Hemoclot, and ECT results. Coagulation values reported in the literature have been grouped as “below,” “within,” and “above” the expected range for people receiving DOAC therapy. In each of these groups, coagulation values were found to be “normal” or “normal or prolonged” for each DOAC, indicating the need of accurate and reliable assays. The U.S. Food and Drug Administration currently has not approved precise DOAC assays such as the Hemoclot, ECT, and antifactor Xa tests. Routine monitoring of renal and hepatic functions is also essential in patients treated with DOACs. The most accurate assays are unavailable in many clinical settings, and standard available coagulation assays are often uninterpretable. Detecting DOACs using qualitative assays is also regarded as an option. A consensus was published by a German expert group on the need for a rapid and sensitive assay that qualitatively detects DOACs in urine samples. Near-patient testing or POC testing would be adequate to generate results in specific patient populations and in certain clinical circumstances. Based on the published and presented data, experts have agreed that the Dipstick test (IVD DOAC Dipstick) of urine samples has the potential to close this gap in clinical practice. Control of adherence to therapy and assessment in emergency situations, such as before surgery, following bleeding, and thromboembolism, will be indications for this POC method. Recent recommendations for the laboratory measurement of DOACs included the DOAC Dipstick. A postmarketing study is currently being performed to verify the validity of the qualitative results obtained by the DOAC Dipstick with the concentration of DOACs in urine determined by LC-MS/MS (NCT03182829). A limitation of this method is that it takes about 1 hour longer for DOACs to appear in the urine than in blood. Another limitation is that patients cannot always produce a urine sample for testing, but this is rare. There are several medical reasons why unconscious patients may be fitted with a urinary catheter; therefore, it is feasible to obtain urine samples from these patients. It is important to consider that antithrombin is lost in patients with proteinuria, which is a symptom of severe renal disease—a contraindication for DOAC therapy. The absence of antithrombin in urine does not affect the detection of DOACs in urine, but the absence of heparin administration shortly before the testing has to be ensured. Of note, DOAC concentrations are much higher in urine compared with blood or plasma samples. This is mainly because of the lower volume of distribution in urine compared with blood, including unspecific binding to cell surfaces or proteins that are not specific coagulation factors. As a consequence, therapeutic ranges for DOAC levels in urine are not known at present. However, therapeutic DOAC levels in blood are also controversial. Strengths of this method are that it is not invasive, can be repeated easily, and is sensitive and specific (mainly based on no overlap in DOAC concentrations between persons not taking DOACs and those receiving DOAC therapy). The lack of blood cells and of proteins in normal urine is one explanation for differences between assays using blood and urine. 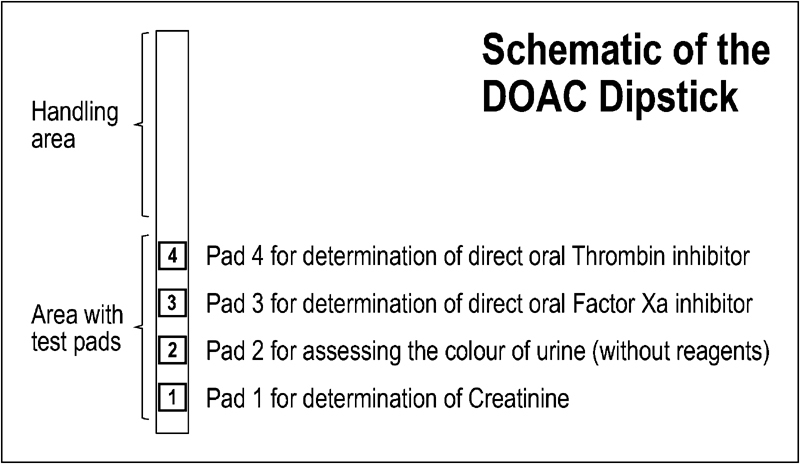 The DOAC Dipstick test pads do not react with heparins or VKAs in urine, therefore, results are easier to interpret than conventional coagulation methods from blood samples because anticoagulants interact in this matrix. The IVD DOAC Dipstick does not require standardization with any of the DOACs because data are not quantitative. DOASENSE control urines have been developed that contain known concentrations of purified rivaroxaban and dabigatran to determine the functionality of the DOAC Dipstick pads. Patients with red-green amblyopia can perform the test using a specific DOASENSE Reader. The qualitative determination of anti-IIa and anti-Xa DOACs by the IVD DOAC Dipstick in urine samples may offer a way for physicians and medical specialists to detect DOACs in specific patient populations. The test results may substantially shorten clinical decision-making. The test is rapid, easy-to-use, sensitive, and specific, which makes it an attractive additional tool in specific emergency medical situations and may expand to other indications with increased experience. J.H. : Managing Director of DOASENSE, consulting honoraria Portola, Sanofi Aventis. The other authors do not have any conflicts of interest to declare. The authors thank Christina Giese for technical assistance, Ulrich Warttinger for the electronic photography, and Simone Mangold for assistance in the preparation of the manuscript. 3 Tripodi A, Marongiu F, Moia M. , et al. The vexed question of whether or not to measure levels of direct oral anticoagulants before surgery or invasive procedures. Intern Emerg Med 2018; ( e-pub ahead of print ) DOI: 10.1007/s11739-018-1854-6.